Oreo (on the right). He's 3 weeks old. Maisie named him. According to Maisie, Oreo belongs to her and Patch (left). He's 3 weeks old. Philip came up with this name which we all liked. According to Gabriel & Maisie, Patch belongs to Gabriel. Oreo and Patch are brothers! This evening, Jen, Maisie, and Gabriel went to the Oregon Humane Society to "just look and probably not come home with two fancy rats. Jen didn't entirely believe this statement, but spoke it anyway as tantrum insurance. After approximately ten seconds of holding these tiny creatures up against our chests with those cute dumbo ears, twitching whiskers, and shiny eyes...a fork in the road came and went before we knew it! We were hurdling down the path of first-time fancy rat ownership. Forget horror movies and the bubonic plague. We're not talking about wild rats, but domesticated ones. Let go of everything you've ever thought about rats and consider the benefits with an open mind. -- Rats are social animals. Many small pets don't like being handled, but rats get used to careful socialization easily, and come to enjoy riding in pockets and on shoulders. They like people! -- Rats are smart. Rats respond quickly to food-based training and seem to love to perform. A friend of mine trained a rat for her college-level psychology course, and came to like the little guy so much that he's now a doted-on pet in her home. -- Rats are agile and sturdy. Try to get a guinea pig to run a maze or climb a ladder and you'll appreciate the fleet-footedness of a rat. Unlike mice, rats can stand up to the handling -- and occasionally, the unintentional mishandling -- of well-meaning children. -- Rats are diverse. 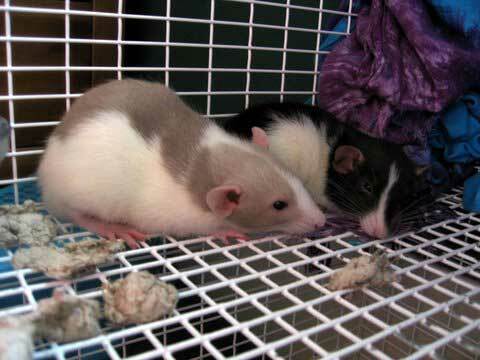 Did you know that rats come in many more colors and patterns than the gray-brown of a street rat and the white of a lab rat? Think colors like silver mink, platinum, blue and chocolate, and markings like hooded (the head a different color than the body) or masked. Gorgeous! -- Rats are easy to keep. Get a cage sized for a slightly larger animal, such as a chinchilla or guinea pig, and your rat will be content. Add bedding, a place for the animal to hide and sleep, a food dish and a water bottle, some toys, and you're set. Your rat will happily eat the food manufactured for them, and will love you if you add fruit, nuts, vegetables and other "people food." No matter. If you're looking for a bright, clean and entertaining pet, you need look no further than the rat. These animals are great for a first pet, or a lifelong interest. I was planning on getting our rats from a reputable local breeder, but in the end we ended "saving" a couple from the pound. That's how I'm justifying not knowing their lineages/temperments/health/etc. They seem sweet and playful and we're just gonna go with that and wish for the best. Jen plans on trying to potty train Oreo and Patch; many people do this! Have you potty trained your rats, Eric? Have any other advice for us?